Database – search the IBA database directly and read site summaries for individual IBAs. You may search the database by species, site name (if you know it) or by province, habitat type, Bird Conservation Region, and a variety of other means. Once you have a site summary on your screen, be sure to experiment with the additional tools that are available, such as the bar chart tool, which gives a graphical summary of bird population data associated with the IBA. 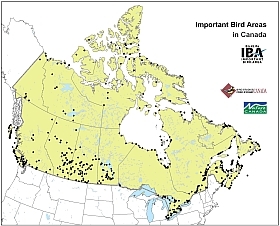 If you would like to help monitor bird populations at IBAs, please click on the link to eBird Canada from each site summary and enter your IBA bird sighting records there. Interactive Map – browse the interactive map viewer application by zooming and panning around to your area of interest; use the map query tool to find and zoom to a specific IBA; use the hyperlink tool to click on an IBA polygon and view the IBA site summary; when you're finished, print out your own custom map or take a screen capture to save the map to PowerPoint. The map tools operate by first activating them (clicking on the icons to the left of the map) and then by clicking or drawing on the map canvas to perform the function in question. Web Mapping Service – IBA boundaries, as well as locations of many citizen science monitoring programs, can be inserted into your favourite mapping client (e.g., ArcGIS, ArcGIS Explorer [free download; like Google Earth, but more powerful], mapping website, etc.). Learn more. Downloadable PDF maps – printable maps of individual IBAs can be accessed from the online directory or any of the tools listed above. Poster-sized maps (24 x 36 inches) are also available for British Columbia, Alberta, Saskatchewan, Manitoba, Ontario, Québec, Newfoundland and Labrador, and the Maritimes. Please note that file sizes are large and may be slow to download. 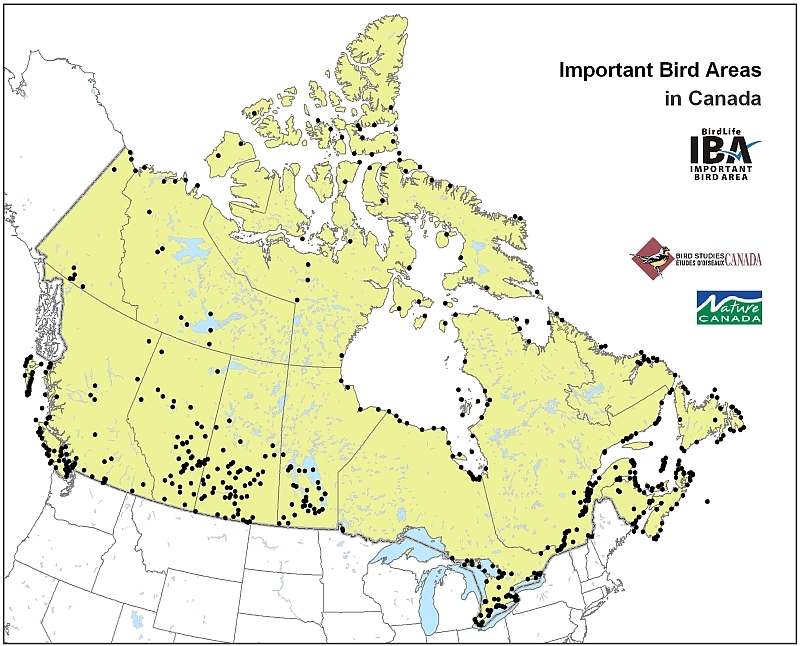 Canada has nearly 600 Important Bird Areas. Click on the map for a closer look, or browse the interactive map viewer to learn more.